Benedick Cumberbatch and Martin Freeman won Emmy Awards last night for their performances on “Sherlock.” Neither were on hand to collect the coveted statuettes. Martin is performing the title role in “Richard III” at London’s Trafalgar Studios and unable to attend. Co-creator and writer Steven Moffat also won for Outstanding Writing For A Miniseries, Movie Or A dramatic Special for “Sherlock: His Last Vow,” winning over Larry Kramer’s script for HBO’s “The Normal Heart,” “Treme,” “Luther,” “Fargo” and “American Horror Story: Coven” He had some stiff competition. 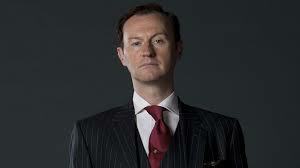 Mark Gatiss has written for and acted in the TV series “Doctor Who” and “Sherlock,” the latter of which he also co-created. For more details, including why Moffat never looks at Tumblr, click here.